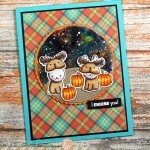 I'm still playing catch up with the latest STAMPtember® release - this time it's with The Greeting Farm!! You can check out the Winter is Here set HERE <-----click! I started by first using one of the snowflake stencils from Simon's Frozen Fractals stencil set. These were released a while ago (they're still available and I have a link to them with the rest of the supplies) but I just had to use them - they're so pretty! To make it easier to work with I sprayed the stencil with repositionable adhesive before sticking it on to my card front and sponging Distress Oxide Inks over it. The 2 main images from the Winter Is Here set were stamped onto Neenah Solar White Classic Crest 80lb card stock with Simon's Intense Black ink then coloured in with Copic markers. I also stamped the small snowflakes and the solid heart image from the set with the same Oxide inks I used to do the sponging. I finished off the inside of the card with the remaining sentiment from the set then stamped the images with Oxide inks and that was it! I stamped the images from the set onto Neenah Desert Storm card stock with Versafine Onyx Black ink, then coloured them in with color pencils. 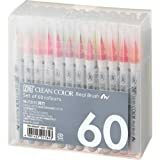 I used my Polychromos (FYI as of posting this the 120 set is 50% off on Amazon right now - link is in the supplies below), but any color pencil will work. I used my Uniball Signo White gel pen to add highlights to all the images, and with this little character on the right I used Nuvo Crystal Glaze on his glasses to give them some gloss. I used Concord & 9th's Plaid Background Stamp Set to create all the card fronts - this was my first time using it and I am in LOOOOVVVEEE with this stamp!! It was so easy to create the plaid backgrounds with it! I decided to do 2 card fronts each in 4 different colors - it made the process move a little faster. I decided not to add any sentiments to the card fronts or insides. 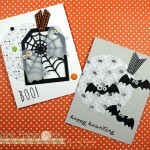 It makes some of the cards easy to use for other occasions than Christmas or Holiday cards. Some of these can be just because or birthday etc. I finished off the inside of the cards with the same images that I stamped off once before stamping on the inside of the card and that was it! Second post and video for today! Scroll down or click HERE if you missed my Color Throwdown post. I FINALLY got the video for these cards edited and wanted to get it uploaded ASAP! 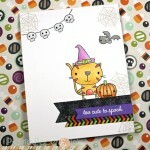 I wanted to use this The Greeting Farm Scaredy Cats stamp set before Halloween is here! Since I couldn't decide on which image to use I used all of them, and made 4 cards. These first 2 were popped up on action wobbles - I show in the video how they look. I linked to the original full size wobbles (that I used here) in the supplies but I also added a link to the newer smaller ones. I can't wait till my pack gets here - I ordered them recently and think I should have ordered 2 packs LOL! The last 2 I popped up with foam tape. 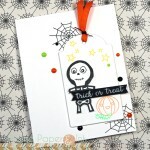 I added Doodlebug Eerie Eyes enamel dots to all of them - LOVE the goofy look it gave them. Of course I paired it all with Doodlebug Boos & Brews paper, DB Spiders Washi Tape and some Doodle Twine to finish it all off. I finished off the inside of all the cards with some more washi tape, a stamped sentiment from the set, and inked up the stars from the set in colours that matched the patterned papers. Are y'all shocked??!?? I kind of am LOL! As you'll see(hear) when you watch the video Katelyn's been in a REALLY good mood today and it's amazing how much more I can get done. The poor kid has been just rotten the past couple of weeks dealing with 4 more teeth coming in (I can't blame her - poor kid has been in agony), and I know a couple have finally popped through so she's in MUCH better spirits. SO while she was in a good mood and playing with her toys behind me I got the editing and voiceover done for this card and video. 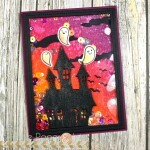 I used the new The Greeting Farm Spooky Kit that I had pre-ordered months ago. And then when it arrived it sat here in the pile of things I need to get to (that pile seems to keep getting bigger and not smaller like it should...) and I didn't know what image to start with first. I decided to go with this little pumpkin boy because he's so cute, and I decided to keep the card super clean and simple (I made it during one of K's naptimes when life was still hell - so I wasn't pushing my luck there and wanted it done while I had the chance) and focused on the Copic coloring. As always it's hard to see in the picture but I coated his entire costume with different colors of Wink of Stella glitter - LOVE! I am so used to always having a video explaining how I made a card that it's odd for me to upload one without a video! Which is why I always put it off LOL. This card being one of them - I made it forever ago (evidenced by the 2012 date on my watermark) and then forgot about it. When I moved all my stamp stuff those few weeks ago this card was in one of the notebooks I use to keep track of layouts, card info etc etc. So I thought I may as well post it now! I had started with this Wild Sprouts Reeta image from The Greeting Farm - an old favourite of mine (that is sadly not available anymore as it got retired some time ago). I had colored it in with Copic markers to match the Authentique Blissful patterned paper pack, and left her little camisole blank to paper piece it after cutting the image out. 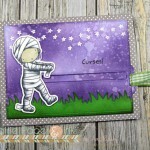 The sentiments are from my Wish You Were Here stamp set. Another personal favorite of mine. The inside was kept pretty simple with the yellow patterned paper meant for writing to the recipient - a regular ball-point pen will show up well over that so it's not an issue. I've become one of those people that LIVES for weekends. Even though when the weekend finally gets here (like now!) it just means I have a TON of laundry and housekeeping and "catching up" to do (but with my current "condition" I can at least sneak in a nap here and there between loads of laundry and whatnot *wink*). Also it's becoming the only time I have to stamp and get crafty. After a full day of work I don't have the energy (or creativity) to make things after - but that's also been due to the lack of sunlight here during the winter. It's still winter outside here in SK (we don't even hope for spring 'till the end of March at the earliest - double blah!) but it's been staying lighter outside for longer each day and that makes SUCH a huge difference. **OH and before I forget (I meant to announce this yesterday but ran out of time) - All That Scraps is now a Member Company at Splitcoast! 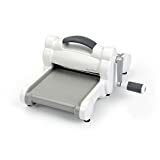 If you're not at all familiar with splitcoaststampers.com head on over there. It's FREE to set up a profile and you'll have access to the forums and gallery and tutorials etc etc etc. I've been a member for years now (I've even got a couple tutorials on there that were published years ago). I haven't been all that active on the forums for some time but now that ATS has their own forum on there I plan on popping in from time to time to "chat". OK now for the card without a video. I made this card last year for my oldest daughter's birthday (you can see the one I made for her this year HERE). 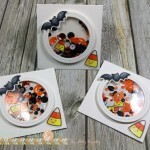 Obviously I enjoy using The Greeting Farm stamps for my kids cards :). I can't for the life of me remember what patterned paper pack this is from - I'm sure if I dug through my stash I'd find it but I'm 99% sure it's not available anymore anyway (though when I say that I usually get proven wrong LOL!). Again I colored her as a redhead - my oldest girl's hair isn't *really* that red - hers is more of a really pretty deep strawberry blond now - it's hard to explain and looks different all the time. This may be a shocker but I have NO video for this post today. It actually feels weird to post a card without a video to go alog with it LOL! ANYWHO - so I colored the image months ago, and I made the card months ago too - it's been sitting here waiting for me to post. I kept putting it off b/c once I did a search I come to find the stamp is no longer available - ugh. Ah well it's still in some stores if you do a google search if you really have to have it! This is the image - Snuggle from the Hope & Grace line by The Greeting Farm - the entire Hope & Grace line is no longer available (from TGF anyway). 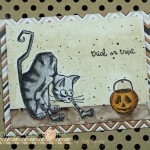 I stamped it onto white cardstock with Memento ink then colored her in with Copics. I had left her dress blank on purpose - when I went to make the card I psper-pieced her dress to match. I had written the patterned paper (Authentique Splendid) on the bottom of the cardstock so I'd remember when it came time to make the card. So then once I had her dress adhered I went in with my W3 and W1 Copics and added a bit of shading to make it look not so flat (I've shown that in loads of videos). 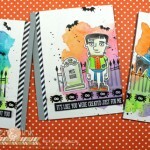 The sentiments are from my Be Happy set. 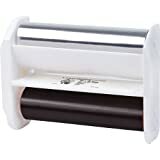 I used Brilliance Graphite Black ink (whereas now I'd use Versafine as I prefer that to the Brilliance ink now - just personal preference) so that it would be REALLY black and stand out a bit. I popped up the Snuggle image and the sentiment on dimensionals (I get mine from Jody - the link to them is in the description box below - LOVE them! ), added some ribbon and promas from my stash and called it a day. I used one of my Spellbinders dies to cut out the sentiment for the inside. 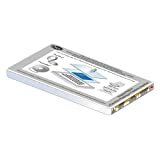 Now that set of dies is no longer available (WHY do all these companies discontinue things I LOVE and use all the time? It's one thing if it's b/c they release something newer and better but more often than not it just gets discontinued for no good reason *cough* SU Key Tag punch! *couch* and there is nothing else like it out there!! OK rant over). Anywho that's it for today. Have a great one! Primas and Brads from my stash. I hope everyone had a good Easter weekend! This was what I started off with. And of course I find out *now* that this image is no longer available (sorry!). I'm pretty sure it was a Wild Sprout image - THIS one is similar (and still available). ......searching......yup I was right it was a Wild Sprouts image - Megan she was called! And it was back in '09 that the stamp was released LOL. SO only 3 years for me to ink it up....(although I swear I've made a card before with it - but can't find it on my blog.....yeah I'm losing it....!). ANYWHO I colored the image in to go with the Authentique Splendid 6x6 papers and paper-pieced her little shirt to match. So here's the finished card. I kept it all pretty simple. Just some patterned paper, ribbon and primas. That ribbon is May Arts textures (if you guys all contact All That Scraps and BEG them to get it back in that might help *wink* I bought all mine from them and I *think* they can still get it in! I LOVE this ribbon!!). 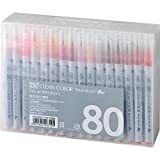 Prima's and brads are as always from my stash (AKA lifetime supply - I seriously will prolly never use up all the primas I have, and I'm OK with that). Sorry folks I'm definitely getting behind now. Saturday's are my "catch-up" days (as in catching up to all the housework/laundry/to-do's etc etc etc) as a lot of things get neglected during the week. I'd love to just sit and stamp all day on Saturdays but that just ain't possible for me! I finally got card #6 done and kept it quick and simple. Ribbon, Primas and brads from my stash. 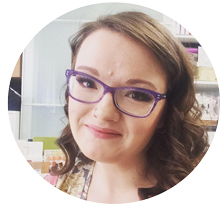 Well I had a client reschedule last minute this morning so I've got some time to get this post up. I filmed this on the weekend before I got all my new goodies so I'm using a different Anya set then the one I showed in the video. Today I thought I would make a square card. I get asked a lot what size of cards do I typically make - and it's always standard A2 size (4.25" x 5.5"). If I make anything other than that size I always make sure to mention/post it. So today's card is a 5.5" square card - and I always chose 5.5" as that is the biggest square card you can make from an 8 1/2 x 11" piece of cardstock (which is what I work with. I don't own much 12x12 cardstock as I don't have anywhere to store it). 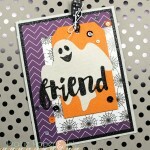 Turquoise and Kraft Cardstock from Stampin' Up!